I won't stop until I'm the ultimate number one. This Pop! 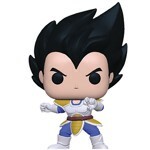 features Vegeta, the prince of the fallen Saiyan race. Regal, egotistical, and full of pride, Vegeta was once a ruthless, cold-blooded warrior and outright killer, but later opts to remain on Earth, with the mission to defeat and surpass Goku in power. Add him to your collection today!